Mintty is a terminal emulator for Cygwin, MSYS or Msys2, and derived projects, and for WSL. Xterm-compatible terminal emulation, coverage of DEC VT300 series terminal features and more. 256 colours and True-Colour support. Full Unicode support, comprehensive character encoding support and wide character handling. Full character attributes support, including italic, underline styles and colours, overline, strikeout, rapid blinking. Alternative fonts: simultaneous display of multiple fonts. 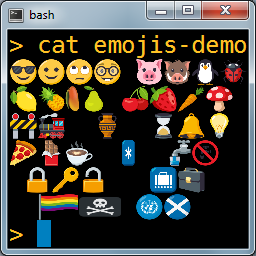 Character composition with full Unicode support, using dead keys and Compose key. Support for all relevant mouse modes, including pixel-grained DEC locator mode. 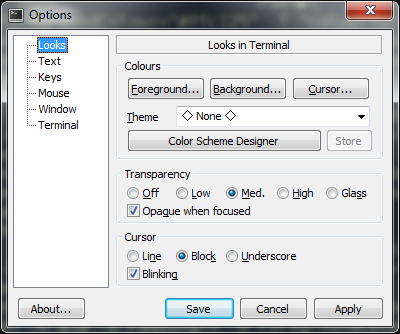 Colour schemes / Theme file support. Background texture and image support. Virtual Tabs / session switcher and launcher. Taskbar tasks (“jump list”) configuration. Flexible fullscreen, fullsize and border options. Screen and scrollback buffer search. User interface language localization support. Window transparency, including glass effect. Multiple monitor support, changing DPI support. 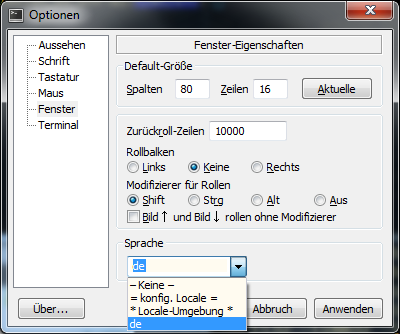 Native Windows user interface with a lean options dialog. Flexible configuration and resource folder options. Options stored in a text file. No registry entries. Switchable terminal logging, switchable character information. 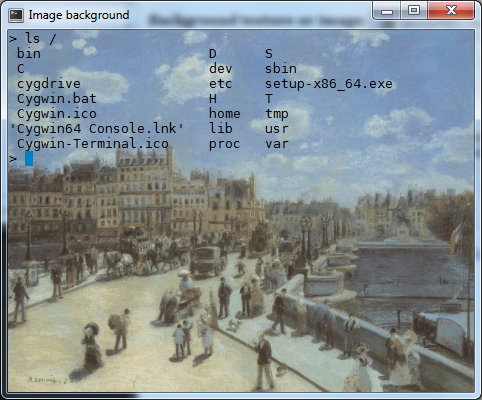 Running in Cygwin, MSYS(2), midipix. Also hosting WSL. Running on Windows XP, Windows 7, Windows 10. Mintty works on all Windows versions from Windows XP onwards. 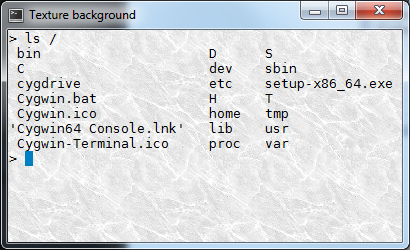 Similarly to other Cygwin/MSYS terminals based on pseudo terminal ("pty") devices, however, mintty is not a full replacement for the Windows Console window (by default running the Windows Command Processor / command prompt / cmd.exe). While native console programs with simple text output usually work fine, interactive programs often have problems, although sometimes there are workarounds. See the Wiki section about Input/Output interaction for hints, especially on the winpty wrapper. The Cygwin package ships with a manual page that can be accessed with man mintty. Invoking mintty with the --help option shows a summary of available command line options. See the Wiki for information on keycodes, control sequences and other hints. 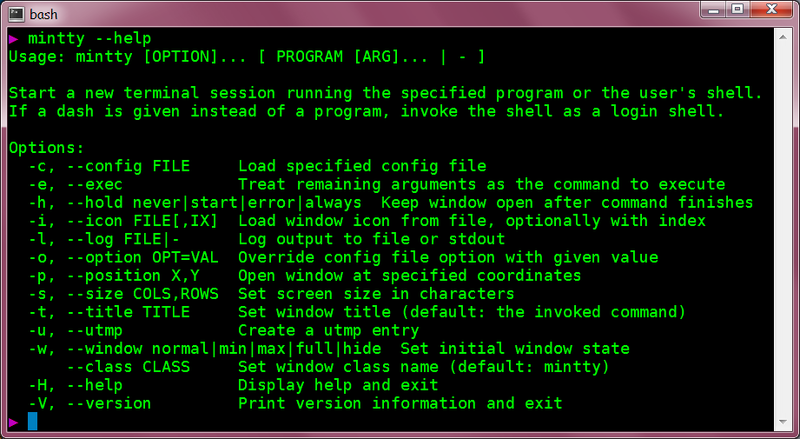 In Cygwin, it is installed as the default "Cygwin Terminal". For MSYS2, mintty is installed by default, or it can be installed later with the command pacman -S mintty. The Release Archive for older packages. Please report bugs or suggest enhancements via the issue tracker. General Cygwin questions should be sent to the Cygwin mailing list, preferably after subscribing the list. Bugs that were reported to the previous repository at Google code before June, 2015, have been migrated here. Mind! Before reporting an issue about character interaction with an application, please check the issue also with at least one other terminal (xterm, urxvt), and maybe the Cygwin Console. See also the hint in Compatibility above. If you consider to suggest a patch or contribute to mintty otherwise, discuss your proposal in an issue first, or on the Cygwin mailing list, or with the maintainer. Repository policy: No unsolicited pull requests! 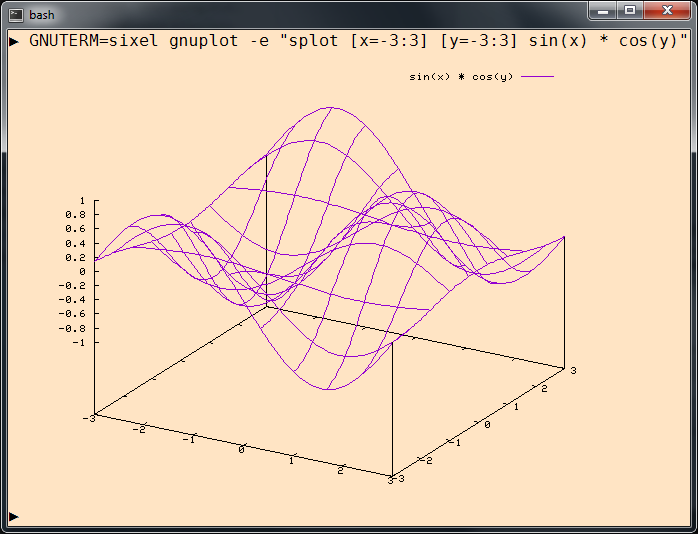 Mintty is based on code from PuTTY 0.60 by Simon Tatham and team. The program icon comes from KDE's Konsole. Mintty ties directly into Cygwin/MSYS and leaves out PuTTY's networking functionality, which is provided by packages such as openssh and inetutils instead. A number of PuTTY issues have been addressed (see Wiki). Mintty showing help text in terminal. Options menu opened.